Pack size: 2 x 300ml bottles & 2 x contact lens case. Review Opti-Free RepleniSH Duo Pack A super purchase and I was extremely happy with it, great value, great solution which cleans your lenses quickly and easily with no fuss. Highly recommended. Review Opti-Free RepleniSH Duo Pack Would much prefer if bottle came in monthly supply. Well worth the extra EUR8! I recently switched to this from Opti-free Express, having used just about every type of contact lens solution available. It costs a few euro extra, but I found it to be well worth the money, as it made all my lenses last much longer than before. Usually I never get the full 30 days out of my lenses before they become uncomfortable and have to be thrown out. With this solution they easily last the full month. I had a lens that fell out and took a few minutes to get it to solution. This would normally mean game-over for the lens, but this solution "replenished" the lens just like it says! It also completely recovered a lens that had dried at the edge overnight as it wasn't fully immersed in the solution like it should be. A life-saver for me, and I also love the no-rub idea. One of the most inconvenient things about contact lenses can be the need to rub them clean after use, which takes up time and risks damaging the lens. With modern cleaning solutions like the Opti-Free RepleniSH, cleaning does not need time consuming rubbing. Using the Opti-Free cleaning solution also has the added bonus of providing extra moisture by retaining tear fluid on the lens far longer than with other cleaning products. • The Opti-Free RepleniSH cleaning solution employs an innovative TearGlyde system to trap fluid from tears and store them on the lens, ensuring that eyes remain moisturised all day long and providing increased comfort. • The added moisture provided by the Opti-Free RepleniSH can allow wearers to keep lenses in for 6 hours longer than with other products, providing crystal clear vision even at the end of the day. • This cleaning solution also provides unbeatable protection against dirt and germs with a powerful disinfectant component. It is also specially formulated to be effective on even the softest contact lenses. • Provided in two 300ml bottles, the cleaning solution should last for three months. 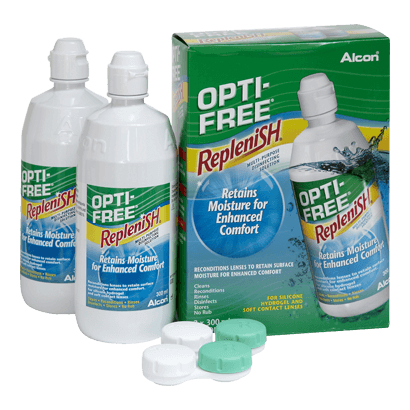 The Opti-Free RepleniSH is a cleaning solution for most people's contact lens wearing challenges. Providing extended moisturisation, this is a great product for those with long working days where good vision is vital.